Meyer Lemon Pound Cake with Meyer Lemon Glaze is a cake made in an 8 x 4-inch loaf/bread pan so I guess you could call it a loaf-cake. 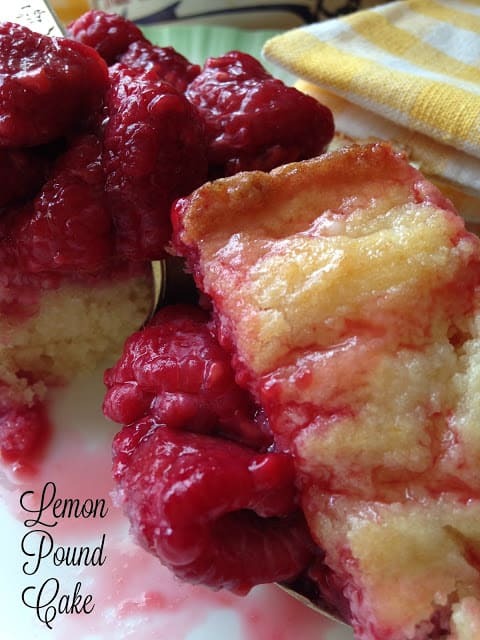 Lemon pound cake is made with Meyer Lemons…those small, juicy, sweet lemons that are really delicious. Meyer lemons are compact and packed full of flavor. Some Meyer lemons are so sweet you can peel them and eat them like an orange. The best place to order Meyer lemons online is from the Lemon Ladies. I highly recommend ordering online from them. In my humble Meyer lemon opinion, The Lemon Ladies rock!! They have the absolute best and sweetest Meyer lemons around. Meyer lemons can also be purchased at grocery stores and specialty gourmet stores. This is a good thing. A few years ago, you couldn’t find Meyer Lemons anywhere, so it’s great they can now be purchased just about everywhere. This recipe for Meyer Lemon Pound Cake makes 2 loaves. I couldn’t decide whether to top the loaves with roasted strawberries or roasted raspberries, so I topped one loaf with roasted strawberries and the other loaf with roasted raspberries! You could certainly use blackberries, blueberries or even mulberries. Don’t like berries or can’t eat berries? Then try stone fruit or pears. Any fruit is fantastic roasted. 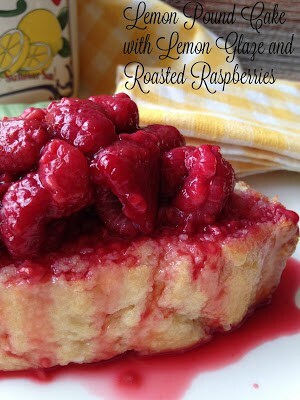 Any roasted fruit will be great spooned over Meyer Lemon Pound Cake. Today we are celebrating Mom by preparing all of her favorite dishes. 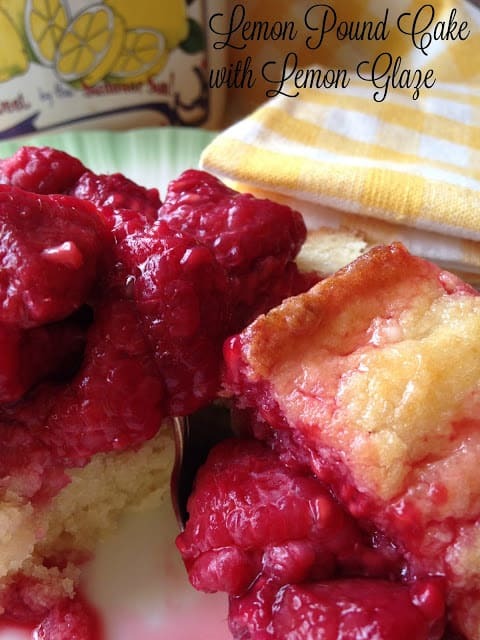 Make Mother’s Day special with this nice and easy dessert. If Mom is a lemon lover or can’t resist a fruity-style dessert, she’ll really love this simple yet fancy dessert. It’s a lemon lovers delight. Beat confectioners’ sugar, lemon juice, 2 tablespoons butter and lemon zest together in a bowl until glaze is smooth. Preheat the oven to 350°F. Line two 8 x 4-inch loaf pans with parchment paper and spray with cooking spray. Sift together the flour, salt, baking powder and baking soda in a small bowl. Set aside. Whisk together buttermilk and lemon juice in a measuring cup. Set aside. Beat the butter, sugar and lemon zest together. Start on low speed and gradually increase to medium-high once the butter and sugar are incorporated. Continue beating until the mixture becomes light and fluffy. Beat in the eggs, one at a time. Make sure each egg is fully incorporated before adding the next one and scrape down the sides of the bowl as needed. After adding all the eggs, add the vanilla. Scrape down the bowl. Add a fourth of the flour mixture and beat on low speed until just barely incorporated. Continue alternating between adding the flour and the buttermilk, beating slowly between each addition and ending with the last of the flour. Divide the batter evenly between the loaf pans and smooth the tops. Bake for 50 to 60 minutes, rotating the pans once during baking. Bake until the cakes are deep golden on top and a cake tester inserted in the middle comes out clean. Cool for 10 minutes in the pan. Remove the cakes from the pans and transfer to a cooling rack. With a long wooden skewer, poke eight holes into the tops of the cakes. Glaze the loaves by spooning about half of the glaze over the cakes, let cool. Pour remaining glaze over cake, allow to set. Meanwhile roast strawberries or raspberries. Preheat oven to 400º Spray baking sheet with sides with non-stick cooking spray. In a large bowl, gently toss berries with sugar and vanilla extract. Spoon berries into prepared baking sheet. Remove from oven and spoon berries into a bowl. I love the idea of roasting the berries. Oh I LOVE this recipe!!! All of my favorite ingredients. Pinned it and will make this weekend. 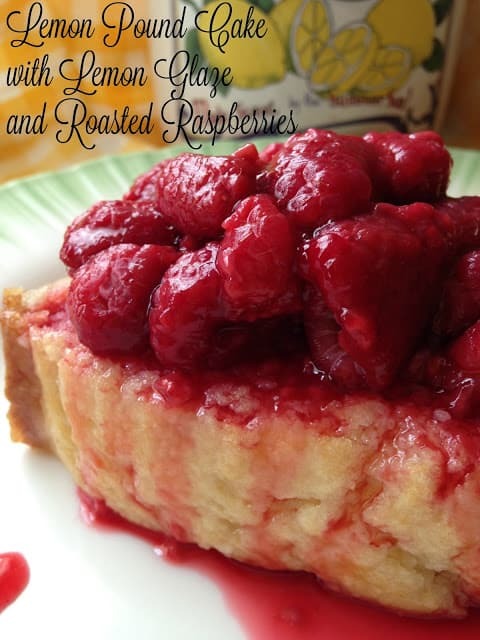 Myer lemons and raspberries are great together. Looks delicious! Perfect for breakfast.